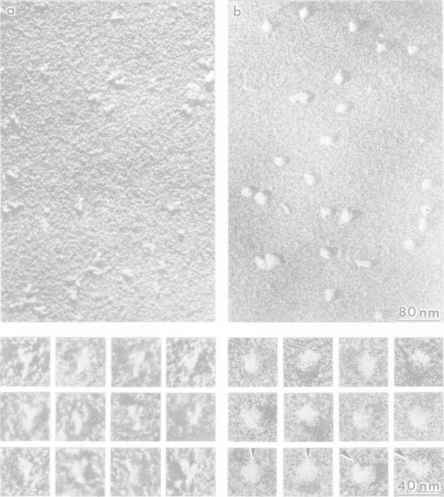 When examined by electron microscopy the isolated bacterial ribosomes at first approximation look like compact rounded particles with linear sizes of about 200 to 250 Â (Fig. 5.1), and somewhat larger, from 200 to 300 Â, in the case of eukaryotic ribosomes. Ribosomes from different organisms and cells, whether prokaryotic or eukaryotic ones, have a strikingly similar appearance. Figure 5.2. Electron micrographs of individual Escherichia coli 70S ribosomes illustrating their subdivision into two unequal subunits; the images are oriented such that the small subunit is at the top and the large subunit is at the bottom. (Original photos by V.D. Vasiliev; see also C.E. Hall & H.S. Slater, J. Mol. Biol. 1, 329-332, 1959; H.E. Huxley & G. Zubay, J. Mol. Biol. 2, 10-18, 1960; V.D. Vasiliev, FEBS Lett. 14, 203-205, 1971). A: Ribosomes contrasted by metal shadowing. In this case, to achieve the necessary contrast the suspension of isolated 70S ribosomes is applied to a carbon film surface and freeze-dried; the particles are shadowed by metal (tungsten or tungsten-rhenium alloy) using vacuum evaporation at an angle of about 75° to film surface; this yields shadow-cast particles. B: Negatively stained ribosomes, prepared as described in the legend to Fig. 5.1. Figure 5.3. 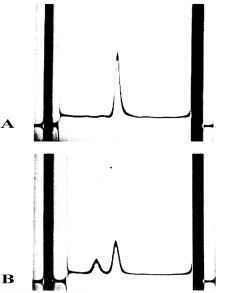 Sedimentation pattern (analytical ultracentrifugation with schlieren optic) of the E. coli 70S ribosomes and the products of their dissociation achieved by lowering the Mg2+ concentration in the medium. A: 70S ribosomes in 10 mM MgCl2, 100 mM NH4Cl. B: 30S and 50S subunits in 1 mM MgCl2, 100 mM NH4Cl.